Two great wines and the best price in the industry delivered to your door at the lowest shipping cost in the business. Everything is fully guaranteed: "You never pay for a wine you do not like." I am privileged to be able to write these things. You see, we are the first and Original Wine of the Month Club®, having been founded in 1972 by my father (see picture!). That is how the idea of wine in the mail started. We were the first and, though there are imitators, there is only one Original Wine of the Month Club®. Whether you subscribe for yourself to learn about the vast world of wine as a "wine correspondence course" or are giving a membership as a thoughtful gift, the Wine of the Month Club® is the premier wine club in America. Each shipment is accompanied by our famous "Wine Letter." Each package is shipped with our informative newsletter describing who made the wine, where the wine is from, what to look for in the wine, how to cellar the wine, and what foods to serve the wine with (as well as temperature settings for storage and service). By the way: no dues or fees, no hidden charges, cancel anytime with no obligation. Just pay no more than $24.96 for the two bottles and around $9.75 for the shipping (outside CA slightly higher). 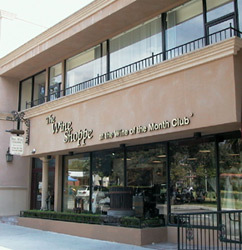 The Original Wine of the Month Club®, founded in 1972 to take the guesswork out of fancy labels and expensive price tags in choosing a great wine, has become America's trusted source of unique and compelling wines. When all the California greats (Chateau Montelena, Dry Creek Vineyards, Jordan, etc.) 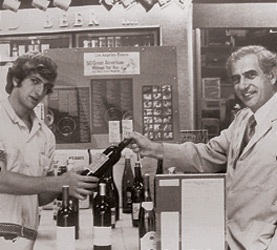 were coming of age, Paul Kalemkiarian set out to taste all that could be to find the best values for his customers at Palos Verdes Wines and Spirits (a premier wine shop in Southern California in the 1970's). As he chose the best two values he found each month, customers of the shop requested that he have them delivered. His son, me, began delivering the selections to the local few that were interested. As the popularity grew, we began shipping the wine directly through UPS, and the idea of wine in the mail was born. There is only one Original Wine of the Month Club and only one federally registered and trademarked Wine of the Month Club®. For yourself: The world of wine is a wonderful world of flavors, food pairing, vintages, grape varieties, growing regions and fun. It brings on laughter, camaraderie, sharing, good times, mellow times and friendship. It is thought-provoking, challenging, engaging and educational. Where do you start? Reading? Tasting? Talking? Meditating? Yes. A little bit of all of these will springboard you into learning and appreciating the world of wine. One of the best ways to learn is to taste wine that has been pre-selected (in other words, wines that are screened for flaws) while reading and understanding what to look for in the wine. Our newsletter covers topics such as terroir, climate, grape variety, winemakers' history, cellaring conditions, recipes and more. I am personally available to all my members for consultation and cellar recommendations. In addition, each month I make 2-4 special buys—wines that I want for my own cellar that I make available to our email members. Consider it a mail-order correspondence course for wine education with the wine! No commitment period. No dues or fees. Only pay for the wine and shipping. Cancel anytime with no obligation. As a gift: What better way of saying "I am thinking of you" than a subscription to the original WINE OF THE MONTH CLUB™? Each month, a shipment will arrive at your recipient's address with two pre-screened wines chosen by me for their enjoyment. The first package arrives in pristine condition in a beautiful linen burgundy box with a personalized gift card. Your personal message is inscribed. Each month your recipient will be reminded of your thoughtfulness, and will also receive the monthly Wine Letter and newsletter binder. Recipes, wine knowledge, great wine and the opportunity to get more of their favorites is at hand. Give with confidence and joy, knowing you are part of the original WINE OF THE MONTH CLUB™. Each month you will receive two vintages of wine (full 750ml bottles). The standard shipment includes a red wine and a white wine. Or choose red wine or white wine only. You may also opt for shipments to arrive monthly, every other month or quarterly, each chosen for its quality and value. I can tell you that of the 400 wines I taste monthly, only 15% are approved for potential club selections and then only 1% make it as selections. Each shipment is accompanied by our digest-sized newsletter, The Tasting Room: a 24-page newsletter packed with information for both the novice and experienced wine taster. It includes winery and winemaker history, recipes, cellaring suggestions, serving suggestions and wine anecdotes to share. Come join me as we embark on a wonderful journey through the vineyards of California and the world, right in your own home. Many members save each month's selections for a monthly dinner with friends. Try it and you will be on your way. These wines represent great value and are comparable to wines you might see at your local wine shop for $20.00-$25.00. Monthly subscriptions are never more than $24.96 per month for 2 bottles, plus shipping & applicable taxes. These wines are the winemaker's passion — wines he has representing his work. Compare with wines you might see at a wine shop for $30.00-$35.00/bottle. Monthly subscriptions are never more than $34.96 per month for 2 bottles, plus shipping & applicable taxes. "Super Premium Wines at less than Premium Prices." If you appreciate the delicate subtleties of a fine premium wine, the exceptional special occasion selections you’ll find in THE LIMITED SERIES are bound to please. You’ll receive two remarkable limited production treasures, 12 times a year. Because these hard-to-find “boutique” wines are in such short supply and are typically not found in stores, this may be your only opportunity to experience their remarkable character and taste. Your pleasure is fully guaranteed. These are wines that represent the upper tier of the wines that we taste. Wines that are limited in availability because of their pedigree. Compare with wines in your wine shop at $40.00-$45.00/bottle. Monthly subscriptions are never more than $45.96 per month for 2 bottles, plus shipping & applicable taxes. Every wine offered through Wine of the Month Club® is fully guaranteed. You can cancel your membership at any time at no cost and no obligation to you. We guarantee that your membership re-order price is the lowest available or we will refund the difference. THE MONTHLY WINE LETTER tells the story behind your wine. You'll learn more about the appelation of the wine. Discover the story behind the grapes and what contributes to the wine's character and blend. The Wine Letter also includes mouth-watering recipes especially selected to match your monthly wine selection. Become a WINE OF THE MONTH CLUB® member now. Join WINE OF THE MONTH CLUB® now! "We found your September Zinfandel at a wonderful little Italian restaurant during a recent visit to Chicago. $32 a bottle! Your member price was $5.99. What's going on here?" "Wow! . . . [the] Merlot you selected last month was unreal . . . to die for." "I can't tell you how much I have enjoyed myself since I joined Wine of the Month Club." "OK guys, how do you do it? No way this Pinot Noir [November selection] is a $7 wine. Send me more!" WHY SHOULD YOU CHOOSE WINE OF THE MONTH CLUB? 1. We are America's original and only WINE OF THE MONTH CLUB®. Now you can share in the honored heritage of America's oldest mail order wine service. Currently in our fourth decade, the only true and trademarked WINE OF THE MONTH CLUB continues a sterling tradition of providing consistently exceptional wines to members. 2. Wines selected by experts. Let's face it. Selecting a wine by its label or price is really a game of chance. You win some, you lose some. But the WINE OF THE MONTH CLUB panel of experienced tasters and noted wine experts evaluates as many as 225 different wines each month. They carefully select and feature only the most extraordinary examples to share with you. And that means you're less likely to end up with disappointing wines. 3. Discover wines you're not likely to find anywhere else. WINE OF THE MONTH CLUB selections are frequently produced by smaller family-owned vineyards, often in quantities too small to be exported and distributed on a large scale. That's why you'll rarely see these monthly selections on the shelves at your local wine shop. 4. Enjoy memorable wines from around the world. Where will next month's featured selections come from? The vineyards are sometimes legendary, some cradled in the world's classic wine regions, such as Bordeaux, Tuscany, Napa/Sonoma, the Rhône Valley. But most often, the happiest discoveries are made in tiny, little-known wineries, sometimes in locales that may surprise you, such as South Africa, New Zealand, Chile and Argentina. 5. Membership is free. No dues. No hidden charges. As a WINE OF THE MONTH CLUB member, you pay only for the wines you receive plus shipping and handling. There are no signup fees, no monthly membership cost. You can cancel your membership at any time without penalties or obligations. 6. Extraordinary wines, extraordinary values. For more than 30 years we've sought out and developed contacts in all the world's wine regions. Because of our valuable relationships with vintners who continue to produce new and outstanding wines, we often find ourselves in a position where we can purchase entire lots at significant below-market volume discounts. We can then share these outstanding values with our members. 7. Wine Newsletter gives you the fascinating story behind your wines. Each month you'll get acquainted with your featured wines in the lively Wine Newsletter. Learn more about where the wine comes from and get profiles on the vineyards. Discover the story behind the grapes and what contributes to the wine's character and blend. The Wine Letter also includes mouth-watering recipes especially selected to match that month's featured wines. 8. Delivered directly to your home or office. Your wines are delivered to your home or office every month. That beats hopping in the car and driving across town to a wine store. Many members prefer deliveries to their office or business addresses to increase the chances that an adult will be available to accept delivery and sign for your wine. 9. Reorder your favorite selections at special savings. As a member, you may select additional bottles of any WINE OF THE MONTH CLUB featured wines while supplies last, at special discounts of up to 65%. What's more, we guarantee that your membership reorder price is the lowest available, or we will refund the difference. Every wine you receive from WINE OF THE MONTH CLUB is fully guaranteed. In other words, you never pay for a wine you don't like. 11. Join us for an upcoming Wine Appreciation Dinner.